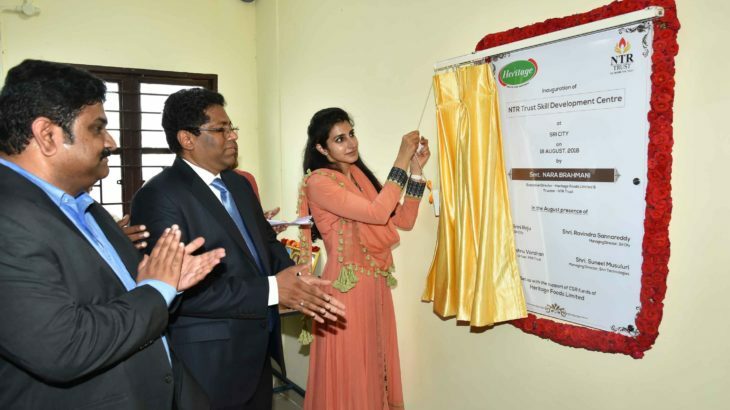 Sri City, August 18, 2018:- Mrs. Nara Brahmani, Executive Director, Heritage Foods & Trustee, NTR Trust inaugurated the NTR Trust Skill Development Centre (SDC) in Sri City in the presence Mr. Ravindra Sannareddy, Founder Managing Director, Sri City, on Saturday. The SDC, which is the 3rd such centre run by NTR Trust, will offer free residential courses in warehouse packing and smart phone assembly. The other two training Centres are in Hyderabad and Vinukonda. The Sri City SDC is established with the corporate social responsibility (CSR) funds of Heritage Foods Ltd. M/s Shri Technologies are the technology partners. Boys and girls who studied up to 8th class are eligible to apply for these courses. Mrs. Brahmani went round the industrial park and visited the Rising Star (Foxconn) industry, in which more than 15000 women are employed. During the visit she interacted with the women employees on the shop floor. Established in 1997, NTR Memorial Trust has been at the forefront of bringing socio-economic change in Andhra Pradesh and Telangana. It endeavours to create opportunities for the underprivileged to achieve their full potential, safeguarding health and safety and reducing poverty and instances of injustice. The Trust’s management team is headed Mrs. Nara Bhuvaneswari and assisted by several stalwarts, including Sri Lokesh Nara and Smt. Brahmani Nara, Under the Youth Empowerment, it has been offering training programmes for youth Empowerment & Livelihoods, since 2010, and till date, helped more than 12000 unemployed youth to become entrepreneurs.